These five time-tested water-play activities will help teach your child to swim — and love it! “I show Mommy my swimming. I can do it myself!” exclaimed four-year-old Braedon, midway through one of our swimming lessons. When he showed off his slightly uncoordinated paddle across the pool, both mom and son had ear-to-ear grins. For many of the families I have worked with as a swim instructor, the excitement of a child’s first solo swim is on par with his first steps. While lessons are certainly helpful, there are many things you can do to teach your kids basic swimming skills, water safety and a love for all things aquatic. Read on to learn five simple, fun activities to help your child take those first independent strokes in the water. These activities can help teach children as young as 18 months how to swim. It’s a great way to introduce swimming skills in stages. So grab your towels and let’s go! Practise talking to pretend fishies by getting your child to blow bubbles in the water. Then ask him to put his ear in the water to listen to the pretend response. 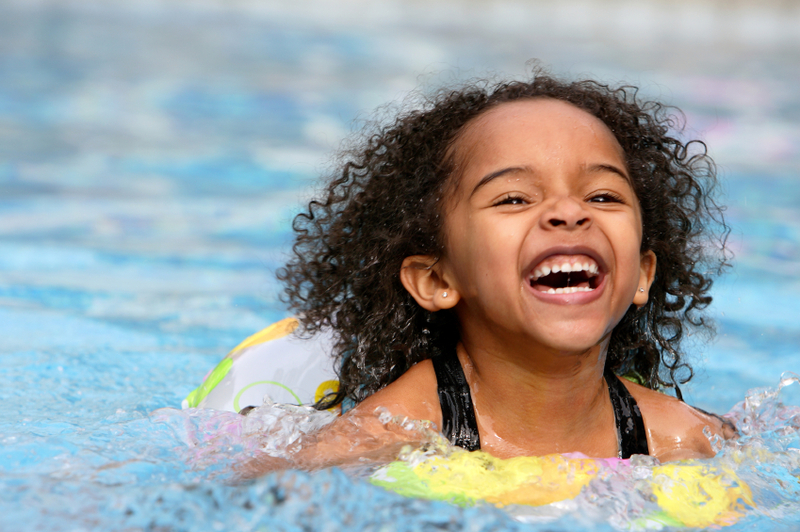 Skill: Breath control, which is the first step in teaching your child to swim independently. Accidentally swallowing water can be a frightening setback, so make sure you encourage him to submerge his face and blow bubbles to increase his comfort level in the water. Tip: Make sure when you submerge your face and blow bubbles, you come up with a smile on your face. Your little one will be more apt to try this if he sees how much fun you have while doing it! Sit next to your child on the steps of the shallow end, or stand facing each other if the pool is shallow enough (water should ideally be at your child’s waist to chest), and ask your little one to try to catch fishies with his hands. Ask him to perform a front-crawl-like arm stroke by reaching his arms up in the air, plunging them into the water, and then pulling the water toward himself, as if there were lots of fishies in the pool that he is pulling toward his body. This will get him used to the arm action necessary to start swimming on his own. Sing a song together while he strokes (I like “Twinkle, Twinkle, Little Star”) and at the end of the song, ask him how many fishies he caught. Then have him throw them back in the water and make a big splash! Repeat the song and try to catch more fishies. Skill: Developing a fast, strong arm motion. Tip: Make sure your child is performing this activity with his fingers together, so the fishies don’t escape between his fingers. This will help with his propulsion when he starts swimming on his own. Securely hold your child under his arms, facing you. Start walking backward through the water. As you pick up a little speed, the water will gently push him into a front float position. Spin slowly in a circle and chant, “Motorboat, Motorboat, Go So Slow.” Pick up a little speed and say, “Motorboat, Motorboat, Go So Fast.” With the last line “Motorboat, Motorboat, Step on the Gas!” you can either blow bubbles or encourage your child to kick his feet. Skill: Becoming comfortable in a horizontal swimming position. Tip: As your child gets more accustomed to the front float position, hold him so that his outstretched hands are around the back of your neck. Help him stretch out his legs, as if he were taking a nap with his stomach on the surface of the water. This will help him get used to the position that his body will be in when he starts swimming. Sit next to your child on a shallow step of the pool. If your child is a little older, he can hold onto the side of the pool, facing the wall. When you say green light, have him kick like crazy! A red light means stop, and yellow light means kick slowly. Tip: Make sure to encourage your little one to point his toes, as this is what will propel him through the water. You can also perform this activity by holding your child under his arms so he is facing you, and walk backward, encouraging him to kick. For an extra challenge, help him balance on a flutter board and get him to practise kicking this way too. In the shallow end, crouch two feet away from the wall, and hold your child so he is standing on your knees, your hands supporting his waist (you are both facing the wall). Ask him to jump off your knees and grab on to the wall. The first few times, he will not actually be swimming, but using the propulsion from his jump to get to the wall. This technique slowly gets your child used to swimming independently. Let him hang on to the wall for a moment so he can get used to supporting his body weight until you come over and grab him to try it again. Tip: Gradually increase your distance from the wall, reminding your child to catch the fishies with his hands and kick his feet. He may struggle the first few times, but keep encouraging him and applauding his progress and, very soon, you will have a super little swimmer on your hands! According to the Lifesaving Society, the majority of backyard-pool drowning victims under five were alone when they fell into the pool. This is why it’s so important that parents provide adequate supervision, and that children learn swimming skills as early as possible; a child’s ability to paddle two feet and grab on to the wall can potentially save his life. Be sure that your child knows to ask permission before entering the water and that access to pools is restricted when they are not in use. Remind children about the rules, such as no horseplay or running on the deck. Life jackets should be worn by kids who cannot swim, unless an adult is providing close supervision in shallow water. Consider hiring a qualified lifeguard if you are hosting a pool party, to ensure the safety of all guests. For more information, visit lifesavingsociety.com or redcross.ca. Gillian Chassels has been a certified lifeguard with the Lifesaving Society for more than 10 years and has taught swimming through the YMCA, Mississauga (Ont.) Parks and Recreation, various summer camps and her private swim company. Originally published in November 2010.